As Pope John Paul II reminded us on October 6, 2002, during the Solemn Mass of Canonization, in his preaching, St. Josemaría Escrivá never ceased to insist that “interior life, that is, the life of relationship with God, and family, professional and social life, made up of small worldly realities should not be separated, but that they should constitute one sole existence, that is ‘holy and full of God'”. These affirmations effectively summarize the message of St. Josemaría and, at the same time, of his figure, because-in him-the message, priestly activity and the human person were fused into one. The end of the Second World War made it possible to think about the universal expansion of Opus Dei, which had already begun, albeit in a limited way (Portugal and Italy), during the war. This expansion meant being subject to pontifical rather than diocesan authority. 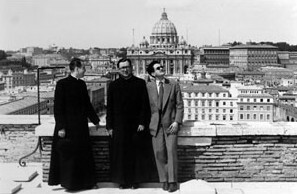 And so in 1946 St. Josemaría moved to Rome, settling there until his death. In 1947 and 1950 Pope Pius XII granted Opus Dei the appropriate canonical approvals, which permitted not only the expansion of Opus Dei, but also allowed married people to become members. Further, priests incardinated in dioceses could also join the Priestly Society of the Holy Cross, in a way compatible with their subordination to their bishops. In 1982, after the Founder’s death, Opus Dei, following a juridical path which he had long prepared and cherished, was established by the Pope as a Personal Prelature, thus achieving full juridical configuration in keeping with the reality of its spirit and activity. All through his long Roman years (1946-1975), St. Josemaría stimulated and guided the expansion of Opus Dei throughout the world, using all his energy to give the faithful of Opus Dei, both men and women, a solid doctrinal, ascetic and apostolic formation, that would permit them to sanctify their different professions and to spread the Christian message from the most varied spheres of life. The expansion was in fact very rapid. In 1946 members of Opus Dei began to work in Great Britain, Ireland and France, reaching most of the countries of western Europe in successive years. In 1948 it began its work in Mexico and the United States and, soon afterwards, in a large number of other nations of the American continent. At the end of the 1950s and the beginning of the 1960s, Opus Dei established a stable presence in Asia and Africa: Japan, the Philippines and Kenya. At the death of its Founder, Opus Dei had more than 60,000 members of 80 nationalities and from the most varied professions and walks of life. As fruit of its activity, numerous people had drawn closer to the Catholic faith or had progressed in their Christian life, and different educational, charitable and apostolic initiatives had been started, such as the University of Navarra (Spain), of which St. Josemaría was the first Grand Chancellor. The establishment in 1948 and 1953 of two centers of formation in Rome, one for men and another for women (the Roman College of the Holy Cross, and the Roman College of Holy Mary) made it possible for members of the Prelature from diverse countries to study in Rome. Both Roman Colleges facilitated the direct and immediate contact of wide sectors of the first generations of Opus Dei members with their Founder; many other people were also able to participate in these meetings. Trips to the Eternal City became increasingly easier, especially from the 1960s. Appointed Monsignor, Prelate of Honor of His Holiness the Pope in 1947, St. Josemaría Escrivá de Balaguer was a Consultant of the Pontifical Commission for the authentic interpretation of the Code of Canon Law and of the Sacred Congregation for Seminaries and Universities, as well as an “ad honorem” Academician of the Roman Pontifical Academy of Theology. In 1959, the recently-elected Pope John XXIII convened an ecumenical council: the Second Vatican Council, which began in 1962 and concluded in 1965. St. Josemaría followed with enthusiasm at the inspiring moments and with concern at the moments of tension (which were not lacking), the Council’s sessions, and took great interest when the different documents approved were later put into practice, attending to processes of renovation and change. The expansion of Opus Dei drew attention to its Founder not only from Christian spheres, but also from society as a whole, and from the media. From 1966 onwards, journalists from France, the United States, Spain, and Italy met and interviewed St. Josemaría. In all cases these were ample interviews, in which the Founder of Opus Dei answered questions thoroughly. In 1968, all these interviews and a homily delivered in 1967 were published as Conversations with Msgr. Escrivá de Balaguer. During these years, St. Josemaría considered it opportune to select, revise, and publish some of the meditations and homilies he had delivered: this was the origin of two new books: Christ is Passing By, which appeared in 1973, and Friends of God, published posthumously in 1977. Other works also published after St. Josemaría’s death include: The Way of the Cross (1981), Furrow (1986) and The Forge (1987). Profoundly united with Pope John XXIII and Paul VI, and with his aspiration that the recently celebrated Council should contribute to proclaiming the vitality and richness of the word of God, St. Josemaría, who throughout his life had conceived of his activity as a great catechism, engaged in intense catechetical activity, not only receiving numerous visits in Rome, but also traveling widely around Europe and America (1970, 1972, 1974, 1975). These journeys enabled him to meet with thousands of people, to whom he tried to transmit the love for God, Christ, the Virgin Mary and the Church that filled his own heart. All this meant a considerable effort on his part –St. Josemaría bore the physical marks of a long life, full of hard work– but he did not hesitate in offering all his energy, and his own life if necessary, for the Church and for souls. On June 26, 1975 the Founder of Opus Dei gave up his soul to God in a saintly way, dying after suddenly collapsing on entering the room where he usually worked, after making a visit to the Roman College of Holy Mary. He passed away with the same simplicity that had characterized his life. The fame of the heroic virtues of the Founder of Opus Dei soon extended around the world, and countless people turned to his intercession, asking for both material and spiritual favors. On May 12, 1981, his Cause of Beatification and Canonization was opened in Rome. After a rigorous study of his life and his writings, and with the proof of a miracle brought about through his intercession, John Paul II beatified him on May 17, 1992 in Rome, before a huge crowd of people filling St. Peter’s Square. After the approval of a new miracle, he was solemnly canonized by the Pope John Paul II on October 6, 2002 before an immense crowd that surpassed the previous one, reaching nearly half a million people. This figure bears witness to the widespread devotion to St. Josemaría Escrivá. But what is more important is the echo reached by the preaching of the universal call to sanctity in all spheres and in all latitudes, to which the Founder of Opus Dei dedicated his whole life.